Nissan launched its first gasoline-electric car developed in-house, the Fuga hybrid, which gets listed mileage of 19.0 km/litre in Japan, comparable to a compact car. The vehicle, its top-of-the-line sedan, will start at 5,775,000 yen ($71,470). 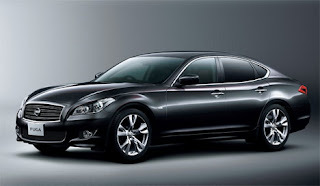 The Fuga is sold as the Infiniti M in many markets, and the hybrid M is due to be rolled out in the United States and Europe in coming months. 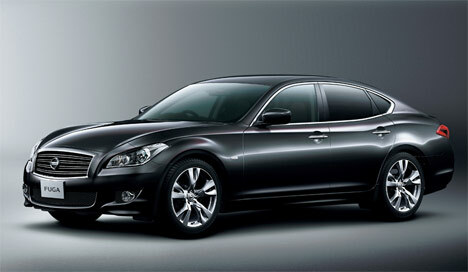 Nissan lags rivals Toyota Motor Corp and Honda Motor Co by more than a decade in offering a proprietary hybrid model. Instead, it is aiming to be the leader in the zero-emission arena with top shareholder Renault SA by introducing the first mass-scale electric car this year. Nissan said its one-motor, two-clutch hybrid system would achieve far better fuel economy, at a much lower technical cost compared with hybrid leader Toyota's complex, two-motor "series parallel" system. The Fuga hybrid gets the best fuel economy among high-end gasoline-electric sedans, topping the Toyota Crown hybrid's 15.8 km/litre, Nissan said. It aims to sell 200 units a month in Japan. Nissan's hybrid system has a structure similar to that of Volkswagen AG , mounting an extra clutch that separates the electric motor from the engine to allow for driving using only electric power when the battery is charged. Unlike Volkswagen, however, Nissan's hybrid system needs no torque converter thanks to advanced electronic controls twinned with a lithium-ion battery, developed by its battery unit Automotive Energy Supply (AESC), held with NEC Corp.
Nissan has been selling a small number of Altima hybrids in the United States using Toyota's hybrid system to clear regulations in California.